In my early days as an underwater photographer I asked an experienced photographer if he ever created his images in black and white instead of color. His response was that it is a “photographic sin” to show the colorful underwater world in black and white. Silly me, I believed him. At least I did for a decade or so until I saw a portfolio of black-and-white underwater images produced by photographic master Ernie Brooks. In an instant my thinking made a 180-degree change of course. I create the vast majority of my images in color. But there are times when a high-contrast scene provides a wonderful opportunity to produce a black-and-white image. 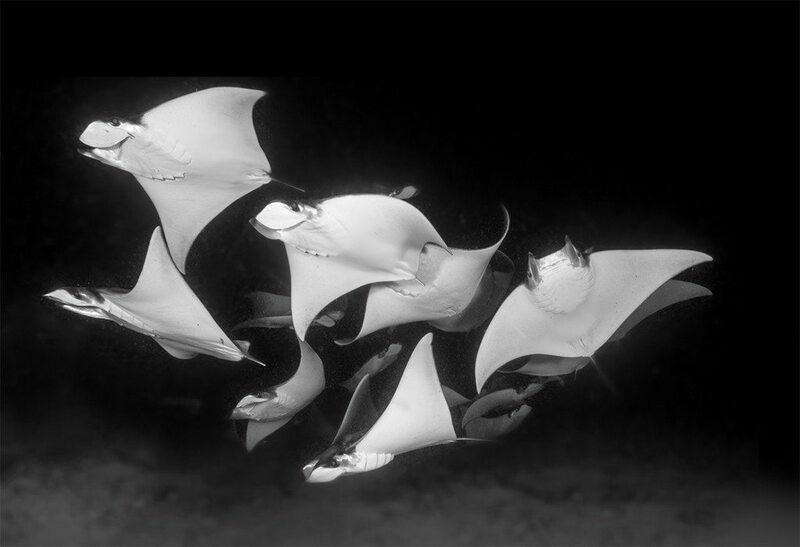 I felt this to be the case with the accompanying image of a school of mobula rays captured on a night dive in Mexico’s Sea of Cortez. The following thoughts share my shooting strategy and my thought process as I created the image you see here: For starters, I knew I would be working over a sandy bottom on a night the sea was stirred up. I felt certain there would be a significant amount of potentially ruinous particulate suspended in the water. The particulate problem was likely to be compounded by having to shoot while facing toward some bright lights that had been placed in the water to attract the rays. Those lights would likely make the lightly hued particulate stand out against the black-water background. However, I thought I could sufficiently minimize the “particulate problem” with post-capture software. The rays have white underbellies, and I knew that if I could shoot from below and properly expose the underbellies that their bodies would stand out against the black water. A key to success in digital photography is to expose for the brightest highlights (the whites) that are important elements in a shot. Grossly overexposing, or “clipping,” an important highlight is usually a recipe for disappointment. Along with avoiding overexposing the highlights, the challenge was to get enough light on the rays to “pull” their darkly hued backs out of the black water so their backs wouldn’t blend into the black water and virtually disappear from my frame. Dealing with that hurdle meant using a wide-angle lens and getting close to the rays so I could sufficiently light them with my strobes. Lastly, while underwater I realized the scene was extremely “high contrast” and that the “rays against black water” provided a great opportunity for a black-andwhite image. I have Ernie Brooks to thank for that. If you have never worked in black and white, look for high-contrast scenes. Properly expose for the highlights and increase the exposure of any critical underexposed darkly hued elements in the scene in post. With a little experimentation and practice you will be pleased with your results.